Your smile conveys several things; it not only reflects your state of your mind but also the state of your skin. Flaunt your happy glowing skin all day along with a simple skin care routine. Keeping your skin spotlessly clean is essential. However, with the rising stress and pollution levels, it can be quite a task. Also with extensive cleansing, your skin is likely to lose moisture. Therefore, it is important not only to keep your skin clean but also retain its moisture. Choose a cleanser wisely that not only wipe the impurities away but also replenishes the facial skin with the required moisture and nutrients. Other than a smile, one of the greatest ways to wipe out the sulking expression on your face is to treat your face with a luxurious amount of moisturiser or day cream. Day creams contain light moisturizers and antioxidants which rehydrate the skin through the day. Day creams can also used as a primer before applying a foundation and/or a compact powder to obtain an even skin tone. Choose a multi-tasking product wisely that contains collagen boosters to replenish your skin and keep it healthy and moisturized. 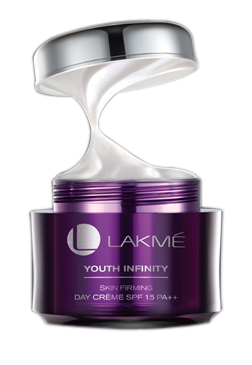 Recommended by experts, Lakmé Youth Infinity Skin Firming Day Cream with Insta Collagen BoostersTM improves elasticity to tighten skin. SPF 15 PA++ protects skin from UVA/UVB, luminising pearls instantly brightens skin tone and niacinamide lightens skin to gives you the perfect sculpted look. If you use night cream, then you do not need to use day cream. Day cream and night cream both are important as they have different effects. If you do not use a day cream you deprive your skin of protection against the UV rays of the sun, free radicals, oxidants and all kinds of harmful environmental effects. You don’t need to use day cream only when you plan to stay at home all day and even then, only on the condition that your skin feels well hydrated. Oily skin does not need day cream This misconception is also completely wrong. Oily skin needs just as much protection as any skin type and although it sounds strange, it needs moisturizing too. If you are of the oily skin type, choose a day cream which does not contain fats, but instead hydrates and protects the skin from the sun. A well selected matting day cream can make oily skin look fabulous. The more expensive the day cream, the better its quality This too is nothing more than a myth. The basic ingredients in all day creams are pretty much the same. You can see for yourself by checking out the ingredients list on the label of the packaging. The difference in pricing comes from the fact that more expensive creams also contain additives such as vitamins and other natural ingredients. Skin Care is very necessary for every human being. Your secret tips so nice and i can bet it will work definitely.